BEHR Process Corporation in Santa Ana, CA (the makers of BEHR Paint), and their eco-driven volunteer group, The Green Team, have generously partnered with TMA in support of our Worm Composting (2nd grade) and Hot Composting (4th grade) programs. In 2010, BEHR Process Corporation donated their annual recycling program proceeds to the Organic Gardening Program ($800 value). 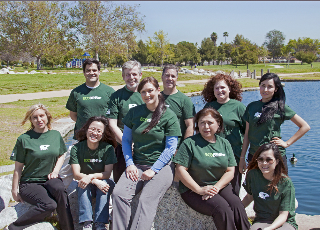 Plus, The Green Team members volunteered their hard work and time at our gardening preparation day on May 14, 2011. The cheerful Green Team members helped us do everything from tilling the soil to planting and composting. The team will keep working on programs that educate and empower the BEHR team in making eco-conscious choices and will continue their partnership with TMA on eco-projects now and in the future. In fact, the team is planning to help out with our upcoming seed planting day on July 14. Thank you BEHR!